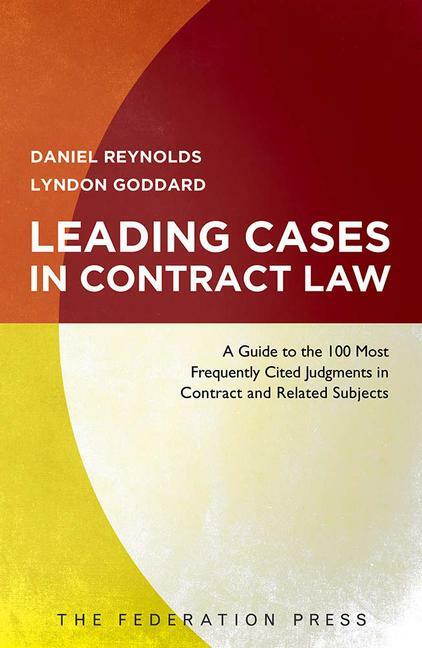 This book provides a summary of the 100 most cited cases in the law of contract and related subjects. Each case note contains an outline of the facts, the issues and the decision, an extract of the most frequently cited portions of the judgment, and commentary outlining the principles for which the case stands and incorporating later decisions on the topic. Each case is then distilled into a one-sentence statement of the proposition for which it can be cited as authority. The book covers not only cases that deal directly with contract law, but also cases that relate to topics having a close connection with contract, such as estoppel, unjust enrichment, relief against forfeiture and equitable vitiating factors. This approach provides the reader with a broad overview of the issues that are relevant to the practice, or study, of contract law. Daniel Reynolds (LLB (Hons), BInSt (UNSW)) is currently the Associate to Justice Keane of the High Court of Australia.